The University of Liverpool has postponed awarding an honorary degree to a former Merseyside chief constable who was on duty at Hillsborough. It follows criticism from representatives of families of the 96 fans who died in the 1989 disaster. 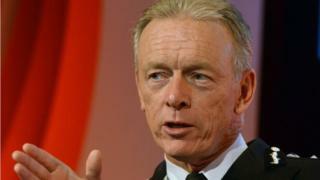 Sir Bernard Hogan-Howe, a South Yorkshire inspector at the time, is being investigated by the Independent Police Complaints Commission. The university said his degree ceremony was suspended pending the outcome. Sir Bernard was offered the degree in 2012 in recognition for his work as chief constable of Merseyside between 2004 and 2011. Patrick Hackett, the university's deputy vice-chancellor, said the postponement was due to the ongoing Hillsborough inquests and investigations. "We are deeply sorry if we have inadvertently caused any distress to the Hillsborough families. "All of us feel great sensitivity to the families at this difficult time." Margaret Aspinall, chair of the Hillsborough Family Support Group (HFSG), whose 18-year-old son James died at the disaster, said she was "appalled" by the university's "insensitivity". Sir Bernard, who became Metropolitan police commissioner in 2011, was due to receive the honorary doctorate at a ceremony in December.